An apple pie without cheese is like a kiss without a squeeze! 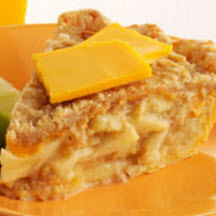 This scrumptious apple pie has a cheesy pastry crust and a sweet, crunchy streusel topping with a ribbon of cheddar cheese running through it. Prepare one pie crust (1/2 package) according to package directions. Work 1 cup of the cheese into crust. Roll dough and line pie plate. Place apples in pastry-lined plate, sprinkling flour and nutmeg evenly over. To prepare topping, combine remaining package of the pie crust mix, sugar and cinnamon. Thoroughly cut in butter. Cover apples with half of topping. Sprinkle with 1 cup cheese and top with remaining topping. Bake for about 40 minutes or until apples are tender.